Download your Team Entry Form, fill it in, scan it and send it to us - as per instructions. · Prizes for the highest score and the highest sum raised for charity. * 50% of funds raised will go to local charities including SeeSaw, a charity providing grief support for children and young people in Oxfordshire, and 50% to a charity of your choice. Obtain sponsorship to raise money for charity. 50% will be donated to Seesaw and other charities supported by Rotary and 50% to a charity or voluntary organisation chosen by the participating team. The Charity Championship Prize for the team, organisation or group obtaining and collecting the largest sum of money for charity by sponsorship. The Darts Marathon Championship Prize for the team, organisation or group scoring the highest number of points in a one hour period. In both cases the prizes will only be awarded if the team is sponsored and collects a minimum of £100. 1. Each team will consist of six players. Each team may choose its venue and time that its attempt is to commence. The Rotary Club can provide details of pubs, with dartboards, willing to host this event. 2. The team will throw their darts for a period of one hour and be allowed a break of not more than five minutes during their attempt. 3. Trebles will count as singles, but doubles will still count as doubles. 4. Only members of the team will be allowed to touch the dartboard or darts. 5. The members of the team must throw from the regulation distances of 7ft 9.25ins (men), 7ft 6ins (ladies). These measurements are taken from the face of the dartboard. 6. Members of the team may only throw three darts (one at a time) and the team must throw in strict rotation. 7. After each member of the team has thrown, the dartboard must be cleared by the thrower before the next member throws. If the supervising Rotarian considers that the dart(s) were thrown dangerously by a team member (e.g. a team member was in the vicinity of the dartboard) any score achieved by the person throwing the dart(s) will not be allowed. REMEMBER THAT SAFETY IS PARAMOUNT. 8. 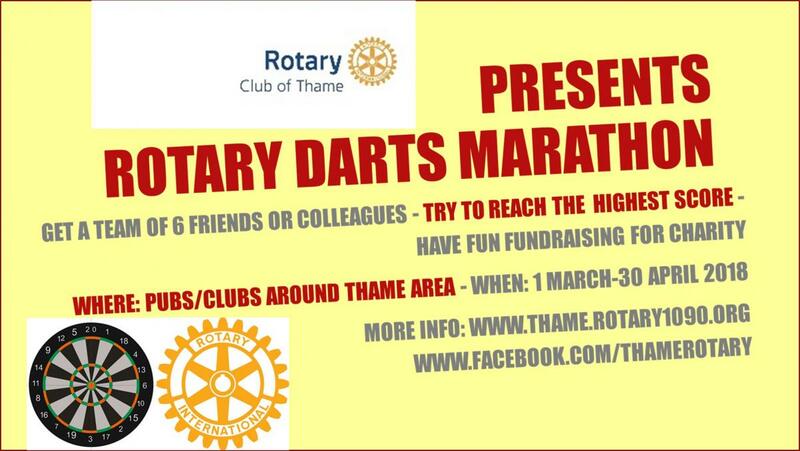 Members of the Rotary Club of Thame (or their nominees) will be in attendance at the attempt and will record the scores. 9. There will be two prizes of £100 each. 10. Players are encouraged to fundraise online. Start your fundraising page on https://mydonate.bt.com/events/thamerotarydarts2018 . However, sponsor forms will be made available. 11. All Sponsor Forms are to be handed to the supervising Rotarian prior to the start of the attempt, and will be totalled. As soon as the score has been totalled, the sponsor forms will be signed by the supervising Rotarian and returned to the Landlord or team captain, who will then arrange to collect the sponsorship monies. When teams elect to support their chosen charities, at least 50% of the sponsorship monies collected must be donated to charities nominated by the Rotary Club of Thame. 13. All sponsorship monies should be collected and handed in to the supervising Rotarian before Friday, 25th May, 2018. 14. The official results and prize winners will be announced when all of the scores have been checked and all of the sponsorship monies have been handed to the Rotary Club of Thame. Contributions by individual teams to specific charities will be publicly acknowledged. 15. Members of the team and spectators will take part at their own risk. All participants must be satisfied that public liability risks are covered by their own household insurance policies. 16. In the case of any dispute concerning the competition, the decision of the organisers will be final and binding on all parties concerned.